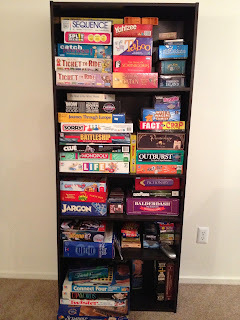 If you've been around here for awhile, you may remember that I'm a big fan of tabletop gaming and organizing said games. Since I was living in a tiny 300 square foot apartment, finding a way to store that many games was a challenge, but it worked for awhile. Marrying Blake meant moving to a bigger place. Like three times as big. For awhile, we had our games stored in a back closet in the same boxes we'd move them in. Deciding what to play was challenging, since we couldn't see them all at once, and getting them out and putting them back was rather annoying. 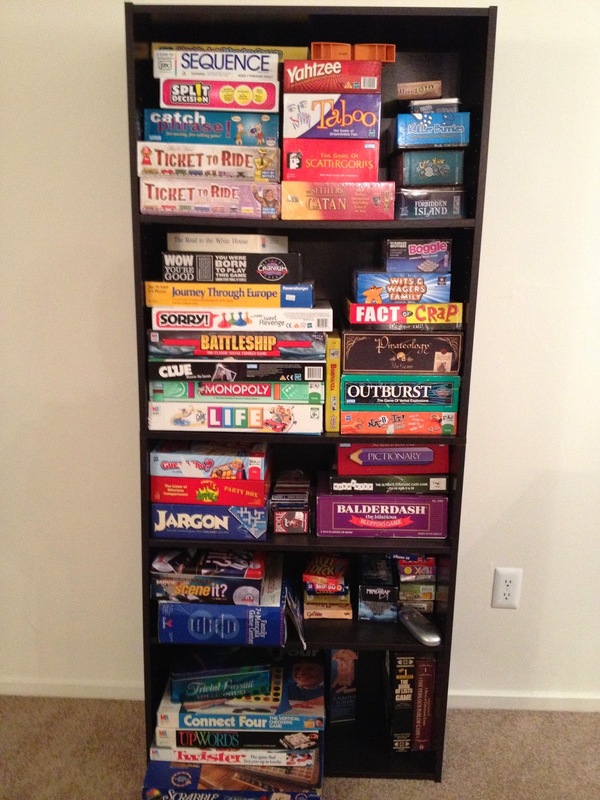 So one day, we bought a bookshelf (one of a few we've purchased and assembled together) and put all our games on it. We are in LOVE. Whenever we're in the mood for a game, we just get one off the shelve and play. It's so much easier! One of our favorites is Ticket to Ride. We have a few maps in the physical game version (Nordic Countries, USA and the 1910 expansion) and a few others on my phone (USA and the 1910 expansion, Switzerland, and Europe). When we're out and about and have 20-30 minutes to wait for something, we like busting out out my phone and playing a round. We get to do something together and time passes quickly. A little healthy (and polite) competition sometimes is quite enjoyable. Our last phone game was played while we were waiting for Stake Conference to start. 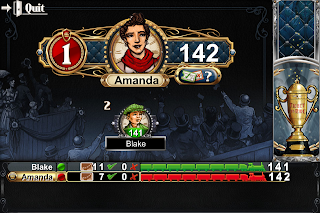 It was a close game and winning by just one point was a fine moment in my gaming life. Do you enjoy gaming? What's your favorite? P.S. We love game nights. If you're local, we'd love to have one with you! I quizzed Brett on Greek vocabulary while we waited in lines at Disneyland. I love playing Nertz. And last Christmas we decided we really like the "I Spy" deck of cards that has such a variety of ways to play and is great for all kinds of ages. I lied. It's a game called "Spot It" not "I Spy" and we highly recommend it.